"Goodbye, Ruby Tuesday" in HotCity Theater's Greenhouse Festival in St. Louis! 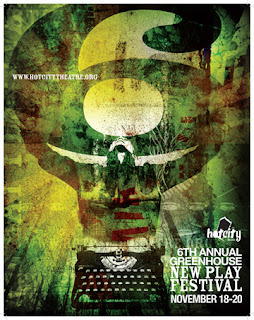 HotCity Theater's 6th Annual Greenhouse New Play Festival. The third stop in my Fall 2011 theater festival triple-header was the HotCity Theater Festival. My play "Goodbye, Ruby Tuesday" was a finalist in their annual Greenhouse Festival, and they brought me out for a week of working on my play, culminating in a reading. It was great to be back in St. Louis, and seeing all the nice folks at HotCity again. My play "Song of Extinction" had been a finalist back in 2008, and I'd attended then and really liked the people and the plays they'd chosen. When I saw their call for submissions, I scrambled to find something to send, because I knew they were good people -- and the kind of theater folks I want to work with. Lo and behold, they picked my play to be a finalist again! "Goodbye, Ruby Tuesday" is my very first play. 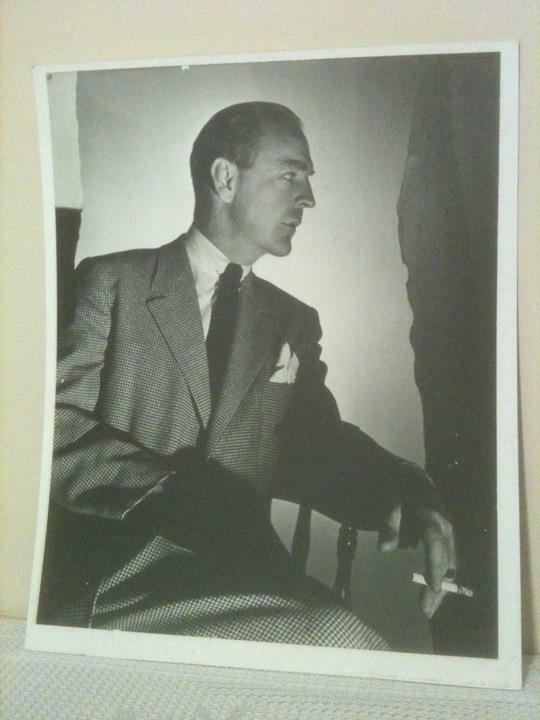 Earlier than "Infinite Black Suitcase," even, which was my first produced play. I wrote "Goodbye, Ruby Tuesday" in the playwriting class that changed my life. I took it after I'd finished my graduate program at USC. I'd worked out in the world for a year or two, then returned to work on staff at USC -- and one of the benefits of working at the university was the opportunity to take classes. I chose to take a class back in my old writing program. The playwriting class happened to have a seat open. I took it! And I've written almost nothing but plays since. It was divided between a two-week intensive with the sweet and wonderful Paul Zindel ("The Effect of Gamma Rays on Man-In-The-Moon Marigolds") and the rest of the semester with Lee Wochner, who became a real mentor to me as I struggled to become a playwright. The assignment was to write a one-act play. "Goodbye, Ruby Tuesday" was the play that poured out of me. "Goodbye, Ruby Tuesday" is a comedy about a woman who decides to leave her life behind to become a commercial fisherwoman in Alaska, and about her family, who has decided that they will do absolutely anything to keep her from going. HotCity had created posters with playwright's notes on them for each of the three finalist plays -- "Release Point," "Goodbye, Ruby Tuesday," and "Shake and Be Saved!" -- and displayed them in the lobby, so audience members could see what they were getting into. 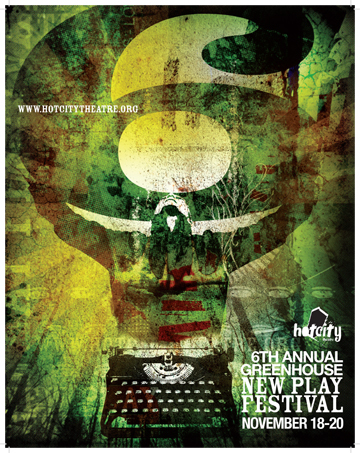 Three plays were selected for the 2011 HotCity Greenhouse Festival. My compatriots were Gino Dilorio, whose offering was an uncompromising two-hander called "Release Point," and Christopher Wall, who had written a fierce farce called "Shake and Be Saved." I liked both of their plays very much. Me and the guys. 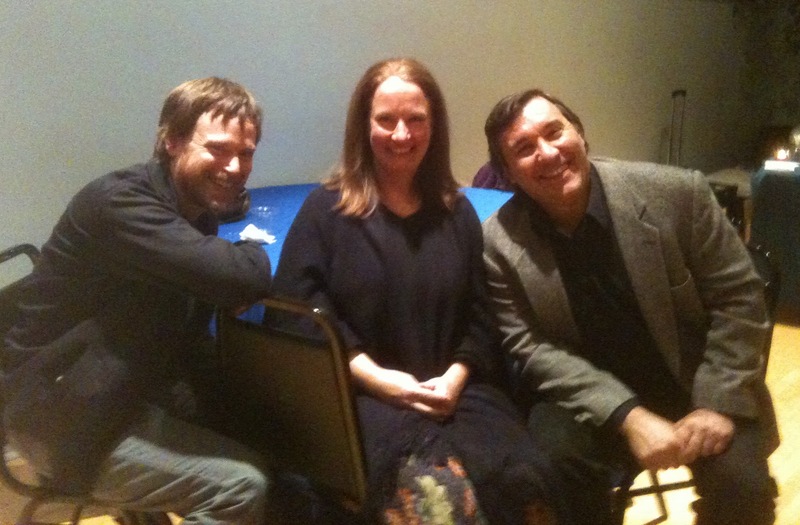 Playwrights Christopher Wall, EM Lewis and Gino Dilorio. They are fantastic writers, and I was lucky to be at the HotCity Greenhouse Festival in such good company! HotCity brought in a dramaturg to work with all three of us on our scripts -- the incomparable Liz Engelman. We each had our own director and set of actors. We had alternating rehearsal and writing days throughout the week, which gave us time to work on our scripts. I was very pleased to have this chance to work on "Goodbye, Ruby Tuesday." Being such an early play, I didn't have a lot of craft when I wrote it. I didn't like the ending. And there were some clunky bits that I'd been itching to get my hands on. This was the perfect opportunity to go back in and really make this play into what it wanted to be... what I thought it could be. Because in spite of its faults, I've always had a soft spot for it. It's a family play. It's a comedy! It's a brother/sister play. And it's got a lot of my heart in it. The view from my room at the Ignacio Hotel -- a very nice establishment, across from St. Louis University, and right down from the theater. What is a visit to St. Louis without a stop for barbecue??? Christopher, Gino and I walked over to Pappy's for lunch one day, for what was both a great lunch and an amusing experience. My lunch at Pappy's. Pulled pork sandwich with Sweet Baby Jane BBQ sauce, sweet potato fries, and deep fried corn on the cob. Yes, you heard me right! Actors hole punch their new pages and insert them into their scripts. Lots of rewrites! And we were! Lots of fun, lots of laughs... just a beautiful night. Standing room only. Several friends in attendance, including Hannah Joyce-Hoven, who had been in my reading two weeks earlier at the Inge Center, and happened to be in town to see her sister. I was walking on air. I'm pleased to report that HotCity has selected "Goodbye, Ruby Tuesday" to produce in 2012! The play will have its world premiere in September. I am absolutely delighted, and can't wait to return to St. Louis! HotCity Theater in St. Louis, MO will be producing the world premiere of "Goodbye, Ruby Tuesday" by EM Lewis in September 2012. 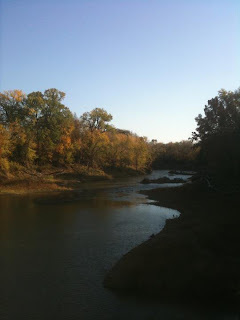 Fall 2011 Inge Residency! Top: Program Director Peter Ellenstein. Next row: Director Stephen Brackett and his playwright, Ken Urban, actors Chuma Gault and Ben Corbett, and playwright EM Lewis. Bottom row: actors Heather Alicia Simms, Mark Pinter and Mina Kim, and my director, Laura Savia. 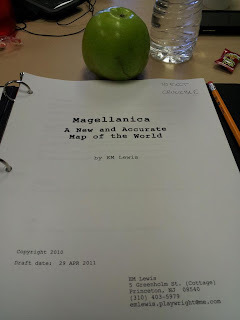 From October 27 through November 12, 2011, I was able to spend some wonderfully focused time working on my play "Magellanica: A New and Accurate Map of the World" in Independence, Kansas. 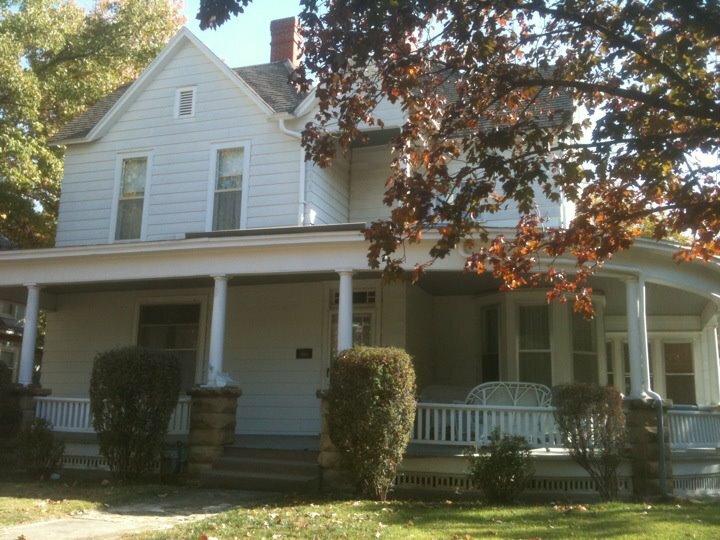 I was the lucky recipient of a residency in William Inge's childhood home, thanks to the William Inge Center of the Arts. I met Inge Center director Peter Ellenstein several years ago, when we were both attending the Humana Festival in Louisville, Kentucky. I was receiving the Steinberg Award for "Song of Extinction," and he requested a copy. He liked it! And ever since, we've been communicating back and forth, trying to find a good time for me to come out to Kansas and do a residency. The timing we finally decided upon couldn't have been better. I'd been having some trouble finding my way into part 2 of the epic play that "Magellanica" is proving itself to be. The prospect of working in depth with a director and a bunch of actors on the play for a focused week sounded like just the thing. And I'd never been to Kansas! I love seeing new places and meeting new people. 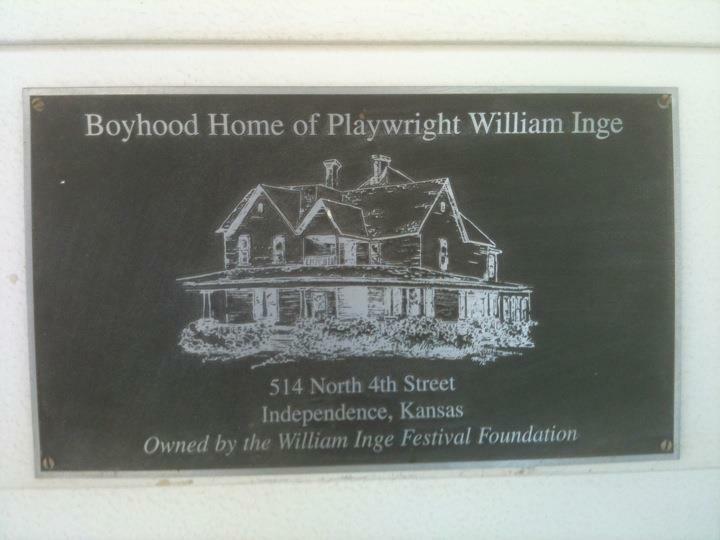 I flew directly from Oregon, where I'd been the Host Playwright for the Ashland New Plays Festival, to Tulsa, Oklahoma -- the nearest airport to little Independence, Kansas. Peter picked me up, and we drove the ninety minutes back to the small town where William Inge grew up. I was the first to arrive; Peter allowed me to come early and stay on after our workshop week, in order to smooth my travel arrangements -- going from ANPF to Inge to HotCity in St. Louis, without having to schlep back to New Jersey between. Being the first to arrive meant I got to pick my room. I knew instantly which one I wanted: the first one I saw. It was at "the dark at the top of the stairs" -- with windows on three sides, looking down on the back yard and neighboring houses. I loved it! 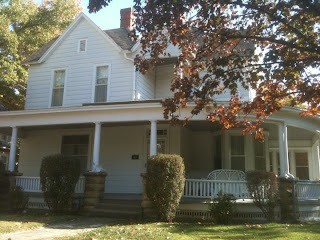 The beautiful Inge House in Independence, Kansas. What a place for a residency! The sign by the front door. Historic house. Pulitzer Prize winning playwright William Inge. He wrote Picnic, Come Back Little Sheba, Bus Stop, The Dark at the Top of the Stairs and Splendor in the Grass. Many of his plays and films were set in small towns in the mid-west like the one he grew up in. William Inge's childhood home is just beautiful -- graciously sized, with a big porch and a nice yard. I stayed there with my director, Laura Savia, who flew in from New York, and the other resident playwright, Ken Urban, who flew in from Boston (where he teaches at Harvard). 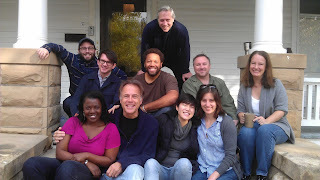 The other director, Stephen Brackett, and the out-of-town actors -- Mina Kim, Chuma Gault and Mark Pinter, all stayed over at Peter's house, two blocks away. The rest of our casts were made up of local actors -- and by local, I mean actors from Independence Community College, where the Inge Center is housed, actors from the community of Independence, and actors from as far away as Tulsa. On the first day of our workshop week together, we had table readings of both plays with everyone in attendance. The two casts would be working separately through the rest of the week, but it was nice to begin things as a single, cohesive group. Ken's play "The Correspondent" is a tight, three-character play about a man who is haunted by his past. My play, "Magellanica: A New and Accurate Map of the World" is a sprawling Antarctic adventure story, about a group of scientists wintering over at the South Pole station in 1985. 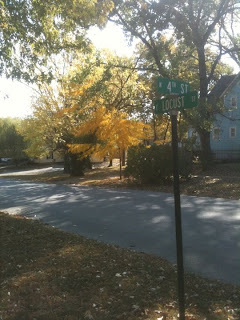 Fourth and Locust -- our street corner in Independence. 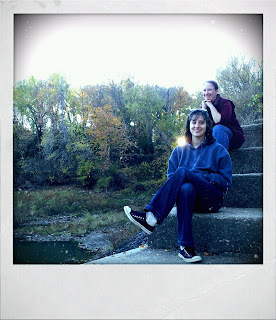 All the leaves were golden, and we had beautiful crisp fall days while we were there. Through the week, we alternated rehearsal days and writing days. 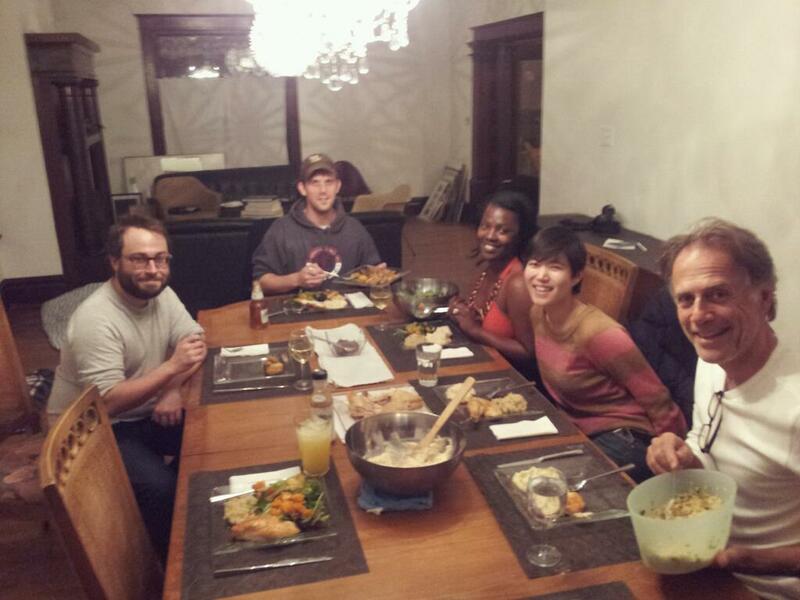 Several of our trusty group liked to cook, and we ended up sharing meals more often than not. Is there anything more bonding for a group than breaking bread together? And washing dishes together afterwards? We worked hard, but there was time between for walks to the reservoir with Laura and Chuma, drinks with some visiting theater artists from Canada, a visit to the local "Neewollah" festival (Halloween spelled backwards), and a stop at the local library to hear one of my actors, Gary, talk about his experiences as a Peace Corps worker in Fiji. We gather around the table. Stephen, David, Heather, Mina and Mark at one of our big family-style dinners. 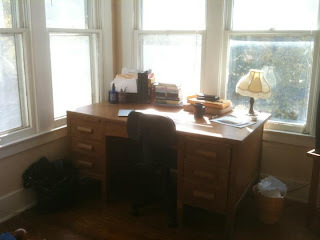 The writing challenge I was facing with my play was how to begin part two of a play that I believe is going to have five parts in all, and cover eight and a half months in the lives of my eight characters. It was a time-traveling problem, really. I couldn't cover every moment of every day in those eight and a half months, while my characters were locked in at the South Pole during the winter season. And I wanted to write the play in such a way that I could reach outside that time and place when I needed to -- back to the Antarctic explorers like Scott and Amundsen and Shackleton and Byrd, and forward to the questions of climate change that are a major focal point of polar science today. I needed a pliable structure that would allow me to do everything I needed to do, and how I began part two was going to tell the audience -- and me -- how I was going to do that. There is nothing like some good table work with a smart director and cast. And it was fun to have my director, Laura, staying there in the house. Several times, I printed out pages and took them into her room, sitting on the end of her bed while she read them. Or she'd make tea for us, while I was working on rewrites. Actors came in and out. Sometimes they brought libations. It was a friendly, fruitful week. By then end of it, I'd figured my way into part two, posited a new structure for part two, and answered my structural questions about the play as a whole. My desk, in my room at the Inge House. I loved my room so much! It has windows on three sides, and was full of light and inspiration. The reading went very well. I was so proud of my cast! The discussion after was lively. We had a pair of little girls in the audience who asked wonderful questions... and one of them showed me the tooth she had lost during the reading when I talked with her afterwards! Everyone wanted to know what happened next... which was great feedback to receive, and great encouragement for me to keep writing. It was awfully quiet in Independence after everyone else left. But I was happy to have some extra writing days before i left for my next gig in St. Louis. And I was able to make myself useful, teaching playwriting workshops at Independence High School, Labette County High School and Independence Community College. I also visited the William Inge collection at the college, where many of Inge's books, paper and memorabilia are housed. Magellanica reading at the Inge Center. From left to right: Heather, Peter, Gary, Hannah, Chuma, David, Mina, Peter and Ben. Directing: Laura Savia. I hope I'm able to return to Independence some time, and share the rest of the story with them!